Click here to discover the latest news! Palmares now available! The PHSC is devoted to the study of the postal history of Canada and the early North American colonies. Originally founded in 1972 as the Postal History Society of Ontario, our name was changed in June 1977, reflecting the expanded nature and scope of the Society. It is a non-profit society whose members are students of postal history at all levels of experience, and it promotes communication and the dissemination of information among members. At present, there are about 410 members in Canada, the United States and throughout the world. More than 300 members are registered at this site and many use it regularly. The Society publishes a quarterly, the PHSC Journal, whose contents vary from fully-researched feature articles to items of current interest. Articles over the full spectrum of BNA postal history---from the pre-stamp era through the various postmark specialties, meters, local and regional histories, to modern postal coding. Each issue carries a balance of material of interest to members. 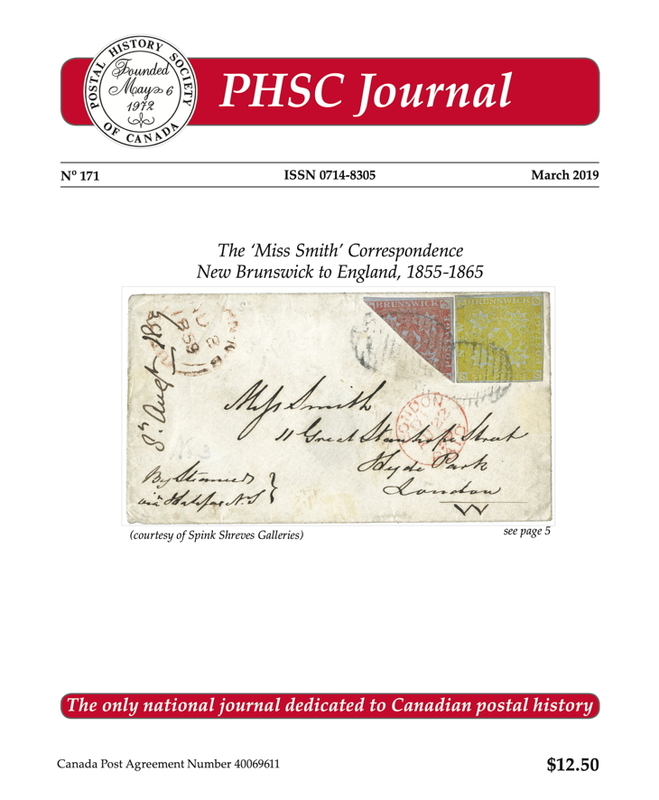 Since 1982, the Society has offered two annual awards to writers on postal history: the Stan Shantz Award is presented annually to the author of the article deemed most worthy in the PHSC Journal, and the Frank W. Campbell Award for major contributions to the study of BNA postal history in other publications. For local stamp clubs, the Society makes available its Certificate of Merit and show ribbon for competitive exhibitions. The Society also presents its Citation of Merit at its discretion to individuals who have shown extraordinary activity in the promotion of BNA postal history, or by furthering the field of postal history studies. For past winners of these and other awards, see our awards archive. Every year, the Society holds meetings at stamp shows across Canada. The Annual General Meeting is held in the summer. This year's Annual General Meeting will be held July 21 at PHSC Symposium 2019 in Hamilton. The Society has several study groups devoted to the detailed examination of specialized aspects of postal history. In addition, via its Allan Steinhart Memorial Fund, it provides support for research in postal history. The Ritch Toop Memorial Award is offered at most annually at each of the national level shows in Edmonton and Ottawa for the best military postal history exhibit of sufficiently high quality. This website, postalhistorycanada.net, also houses Canadian postal history databases and other records of the Postal History Society of Canada for use by its members. The database portion of the website became operational on the 10th of December, 2007. Most of what appears here are parts of ongoing research projects and thus are constantly evolving. In the public areas of the site, you will find descriptions of all of these projects. If you need help moving around the site, you should find answers at the How-To link at the top of the page. Registration is required for PHSC members to use the members-only areas of this website. The PHSC is Affiliate 1003 of the Royal Philatelic Society of Canada and affiliate #AF0067 of the American Philatelic Society.